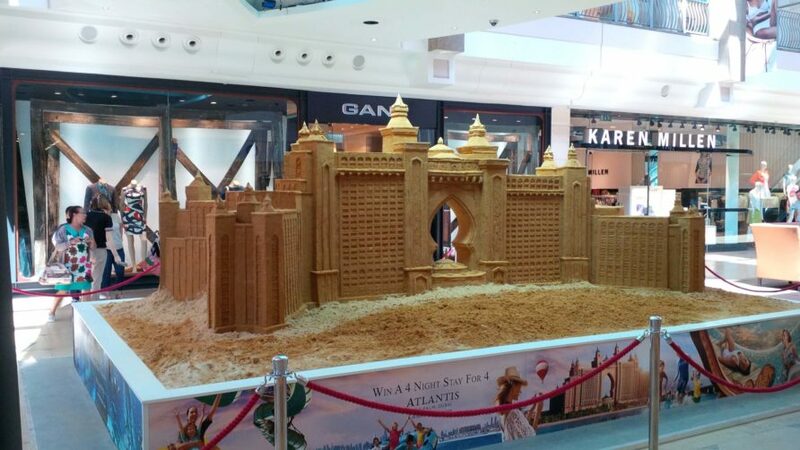 Brief: A request came to us for a hotel sand sculpture replica of the luxury hotel Atlantis The Palm in Dubai to be sculpted at the Blue Water shopping centre in the UK in order to increase awareness of the hotel and the 5 star settings it offers as one of the top hotels in the world. The awareness was mainly aimed at social media with a give away prize of a few nights stay at the hotel for the person who tok the best selfie and placed it on the Atlantis The Palm Hotels Facebook page. Action: Our sand sculpture professionals put together a plan to construct the 8m wide sand sculpture within 3 days in order to meet a deadline from our client. Result:The sand sculpture was successfully created in time to meet our clients deadline. 1000s of selfless were taken though out a 4 week period and the social media marketing concept seemed to have been successful with an increase in numbers of visits to the hotel by UK residents over the following 6 months.